The Gene B. Glick Company is honored to have such hard-working, dedicated employees and we are proud to recognize these individuals in a monthly employee spotlight! Q: What is your title at the Gene B. Glick Company? A: I am the assistant property manager at Carriage House Apartments of Virginia Beach in Virginia Beach, Virginia. A: I started with Glick in August 2014 as a temporary office assistant. Glick then hired me as the full-time assistant property manager in February 2015. Q: What has kept you with Glick? A: I really like what I do and where I’m at. I like working with my Carriage House team. I’ve learned a lot as an assistant property manager too. I love the training at Glick and I’m always learning something new. Q: What brought you to Glick? Why did you want to work here? A: I relocated to Virginia because I had a niece in the military who was deploying overseas and she asked me to look over her place and vehicle. The previous company I worked for had gone out of business, so I connected with a temp service and landed at Glick. Q: What training/education/background did you bring with you? A: I brought a lot of office experience to Glick. I’ve worked at a furniture store, a credit card company, a casino vault and a collections department for a hospital. I didn’t know that my initial temp work with Glick would lead to where I am now but I’m very happy. I’m thankful Glick and Carriage House recognized my talent when they saw it. Q: Why is the work you do at Glick important? A: I see my role at Carriage House as the hub. Whatever the issue, chances are I’m going to be involved in some way and you’ll need to talk to me. 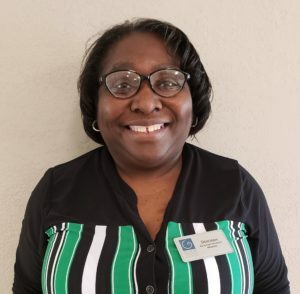 I feel like my role is important because I serve as the connection between our on-site team and our residents. That back-and-forth communication is critically important. Q: What part(s) of your job do you like the most? A: Sitting behind my desk keeps me on my toes and I get to help people. I also really like the Carriage House team we have now. We can joke with one another but then we also know when to be serious. I see these people more than I see my own family at times – I have a sweet spot for them in my heart. Q: What would surprise people about your role and the work that you do? A: I always tell people that the longer I’m with Glick, the more I see it as a really good company. I really feel like the people at Glick are sincere and like their jobs. My colleagues are also like family I didn’t know I had – like cousins who live down the road. A: I think the personal touches have surprised me the most. Even though we’re a big company, Glick still takes the time for personal touches. Glick takes care of its employees and sometimes companies lose that. Glick doesn’t. A: I was born and raised in Caruthersville, Missouri. I lived there for 30 years until I moved to Chicago. I lived in Chicago for 15 years and then I moved to Norfolk, Virginia, where I live now. A: I love to cook and feed people – it relaxes me. I cook all the time and I do everything from scratch. I’ll get into the kitchen and come up with some kind of recipe. I also cook for a lot of people. I once cooked for 700 people at church! I love to read as well. I will read pretty much anything. I also have four children and six grandchildren. Q: What would surprise Glick team members about you? A: I love being surprised and giving surprises. Most of my surprises are food. I love it when someone enjoys something I put my heart and soul into. Q: If you won the lottery and didn’t have to worry about money, how would you fill your time (e.g., dream job, hobbies, causes)? A: I’m a simple girl and I like simple things. If I won the lottery, I would buy a house and my dream car – a Lexus RX-350. And I would spend two or three months in Fiji. This might surprise you, but then I would come back to Glick and continue to do my job at Carriage House. And I’d make sure that the kids living here have something nice. Q: Do you have a bucket list and if so, what is on it? A: Yes, I plan to go to Fiji. I’m giving myself five years to save and then I’m going to Fiji! Q: Do you live life by any certain motto or philosophy? A: I thank God for waking up every single morning.